I’m always on the look out to learn new tricks and advise when it comes to makeup, hair and skin. 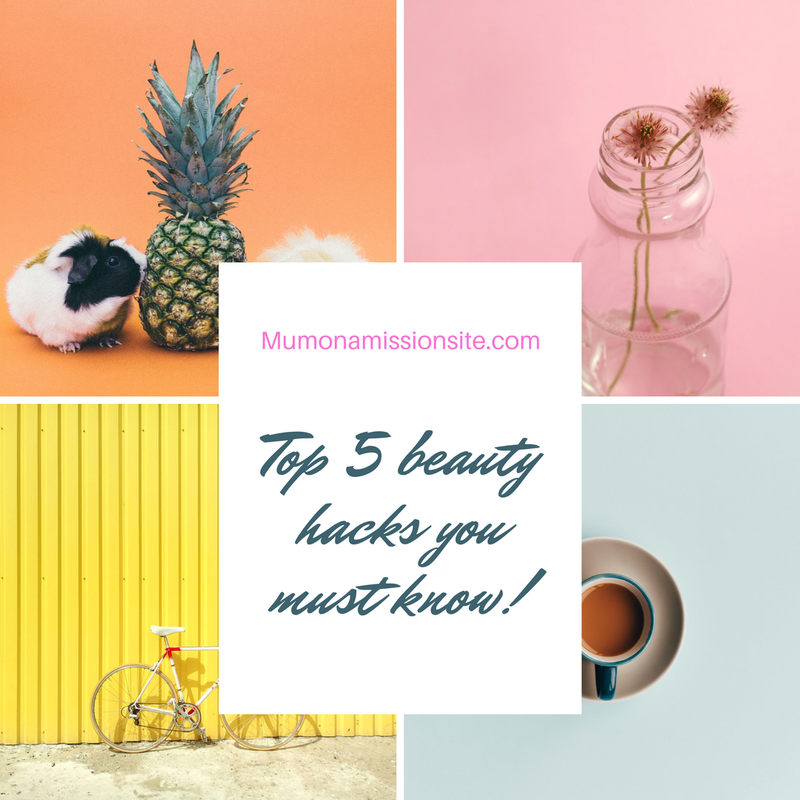 Being a hairdresser and beauty therapist it’s something I take a lot of interest in, so below I’ve listed my top 5 DIY skin care routines and benefits for all you busy ladies looking for a quick fix! This is super easy to make and only takes a couple of minutes to whip up tops. It contains 2 teaspoons of baking soda, 1 teaspoon of water and a squeeze of lemon juice. You can double the quantity of ingredients if you desire more mask. Give it a good mix until it forms a paste like substance and then with the back of a spoon spread it over your face and leave for 5-10 minutes to dry. Once the time is up rinse off and leave your face for another 5 minutes before admiring your refreshed skin! Only 2 ingredients needed for this, sea salt and water that’s it! And the quantity is purely to preference. I wanted to form a paste so I could see it on the red mark/spot and I was satisfied I’d covered the area fully. So I used half a teaspoon of sea salt and then a dribble of water before mixing with the back of a spoon. Sea salt can be used on the skin because it has powerful antibacterial properties to pull oil from the pores. Once applied to area leave for up to an hour (10 mins for sensitive skin) then rinse off. My all time favourite health hack, so simple yet so many benefits from drinking a cup of hot water and lemon slice in the mornings. I like to cut up a lemon for the week and keep it in the fridge so I can just take out a slice every morning and pop it in my cup. You also don’t have to drink it hot, I like to drink it warm in the mornings and then drink cold water bottles through the day with a slice of lemon in there. Not only does it flavour boring water and keeps you hydrated, but it reduces the bacteria in the small intestine which can cause acne. It reduces toxins and flushes through purifying the body internally. One of my all time favs. 4. Removing makeup without a makeup remover. There’s so many useful things you can use coconut oil for that isn’t to do with food. Coconut oil seems to be a household cupboard item that has so many benefits and go to uses it’s pretty amazing really. So here’s another I’ve found, removing makeup! Is your skin starting to get a little sore at night from constantly rubbing your makeup off with baby wipes and cotton pads? And never fully getting all your makeup off at night? Well here’s a hack you may just want to try, by gently massaging a small amount of coconut oil into your skin it breaks up the makeup leaving you to follow up with a cleanser to wipe the makeup and oil away. Another pro tip- apply coconut oil to the ends of your hair and leave over night as a repair mask (ends only though)! It also works wonders as a body moisturiser! I told you, so many uses! Anyone else pile on the concealer in the mornings to hide the dark rings? Concealer is a permanent part of my makeup routine now because I love how it brightens my skin up in certain areas but I’ve learned of a super easy hack to tackle the puffiness, redness, circles and dark shadows before makeups even applied! All you’ve got to do is pop a metal spoon in the freezer over night, and remember to take it out whilst your making your morning coffee ( or hot lemon water!). Place the back of the spoon on top or just under your eyes. This will reduce all the problems listed above! Cool cucumbers 🥒 and cool tea bags also do the trick if you have a bit more time before you start your morning routine. Check out my hair hacks that you need to know here! 👉🏼👉🏼 10 simple DIY hair tips you must know! Next Panasonic bread maker and 2 recipes! Great tips! Can’t wait to go try the spot cream diy.